The coat of arms is shown in the canton portion of the national flag of Cape Verde. An important representation of the state, the various elements have wonderful meaning. The cogwheel and pick for example, is said to symbolize the hard labor of the local inhabitants. 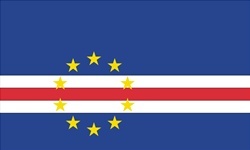 The national motto of the republic is also displayed on the state arms, which states: "Republica De Cabo Verde." Most national flags have very detailed specifics with regards to flag proportions and such. The flag of Cape Verde does not however. No specifications detailing the height and width of the flag are in existence. However, the dimensions that make up the complete flag are given proportionally with respect to the dimensions of the sides of the flag, which is 2:3. Both the 1975 and 1992 flags have the same proportions. Also the color shades are not specified. If interested in more info on this ensign, click here.